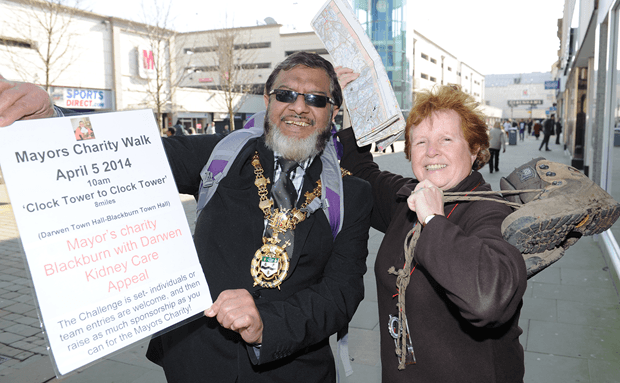 Mayor of Blackburn Cllr Salim Mulla has launched a charity walk to help his target of buying vital hospital equipment. The walk, at 10am on Saturday, April 5, is ‘From clock tower to clock tower’, will take trekkers from the clock tower in Darwen to the one in Blackburn – a distance of eight miles. It will raise funds for the Blackburn with Darwen Kidney Care Appeal. Individuals and teams are welcome to sign up and raise as much sponsorship as you can for the Mayors Charity – The Blackburn with Darwen Kidney Care Appeal. The aim is to buy dialysis equipment for people in East Lancashire suffering from kidney disease. The walk is being run with Blackburn and Darwen Group Ramblers Association. It is a linear walk, so people taking part will need to arrange getting back from the finishing point at Blackburn clock tower. Download the entry and sponsorship form.